This year’s placement drive at some of the prominent B-schools across the country saw consulting majors Accenture and The Boston Consulting Group (BCG) emerge as leading recruiters. These institutions are Indian Institute of Management-Ahmedabad (IIM-A), Bangalore (IIM-B), Calcutta (IIM-C), Lucknow (IIM-L), Kozhikode (IIM-K) and XLRI - Xavier School of Management. These firms are extending offers, mostly in double digits. Along with the likes of Bain & Co, McKinsey & Co, Deloitte and Avendus, among others, these companies hint at the changing dynamics of white-collar job market. Accenture has emerged as the top recruiter across IIM-A with 24 offers, IIM-Bangalore (31), and IIM-Calcutta (24). On the other hand, BCG was the top recruiter at XLRI and one of the biggest at IIM-Lucknow, along with Accenture and Deloitte. In IIM-Kozhikode too, it was the one of the biggest, along with McKinsey and Bain. Recruitment experts and consulting firms attribute this year's trends to the shifting dynamics of the Indian industry, forcing companies across sectors hire consulting firms to help chalk out future plans and lead new projects. “All industries are going through a transition which has provided a great opportunity for consulting firms. It also augurs well for the economy as high-quality jobs are being created which need talent provided by these B-schools. Campus hirings may not immediately bring return on investments but recruiters know in future they can turn fruitful,” says Rituparna Chakraborty, executive vice president at TeamLease Services. Mostly picked up at entry level, the job offers extended by consulting majors carry hefty packages with challenging profiles in areas like strategy, analytics, data science and project management, among others. According to consulting firms, the large number of hirings are being driven by rise in projects. “The recent hirings are largely driven by growth in business as we have been growing in double digits. In the past few years, most of our practices have grown at breakneck speed. However, some are growing more such as in digital area and engagements with value creation," says Sumit Gupta, partner, director and recruiting chair at BCG India, which hires 75 per cent of its talent from campuses. According to data of Associated Chambers of Commerce and Industry (ASSOCHAM), the Indian consulting industry is expected to record revenues worth Rs 27,000 crore by 2020. It is estimated that approximately 500-600 high-value consulting contracts worth roughly $250 million are awarded every year by Indian companies, with a part of them being as high as $2 million each. As for the job offers made in double digits, especially at top B-schools, including IIMs, by consulting firms like BCG India, it is because top campuses in both management and engineering domains contribute to 80 per cent of their hiring. "For the rest 15-20 per cent we keep evaluating campuses. 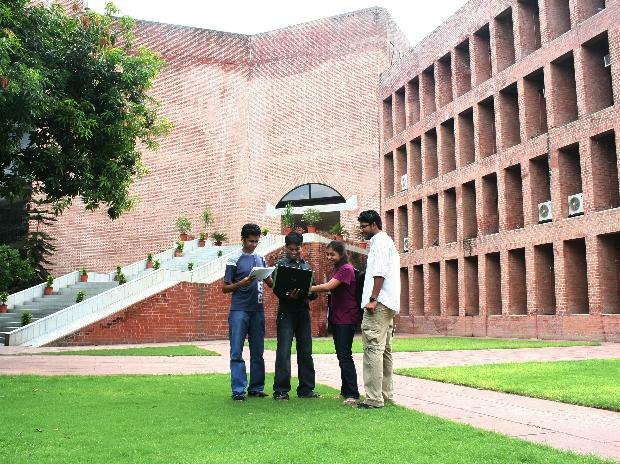 For instance, we tried XLRI a few years back and now it is a regular destination for us. There is a committee internally that surveys campuses that we would like to go," Gupta said. 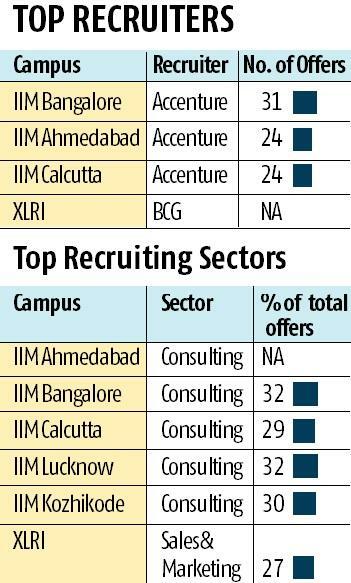 Sector-wise too, consulting has topped the offer charts at B-school campuses. Consulting firms have clocked 32, 30, 29, and 21 per cent of total offers at IIM-Lucknow, IIM-Kozhikode, IIM-Calcutta and XLRI-Xavier School of Management, respectively. At IIM-Bangalore this year, consulting firms, led by Accenture, together have made 161 offers. The other top sectors are finance, IT, FMCG and E-commerce, among others, in varying degree across campuses. Meanwhile, compensation packages too have seen a decent rise during final placements at top B-schools this year. Among the data available, IIM-Kozhikode posted a 16 per cent jump in its average salary at Rs 20.6 lakh per annum, while that of XLRI rose by 11.19 per cent to stand at Rs 22.35 lakh per annum.